While a Reddit user recently demonstrated that the HomePod's power cable can technically be disconnected from the speaker by pulling on it with a lot of force, Apple warns that it should not be removed, according to an internal document distributed to Apple Stores and Apple Authorized Service Providers. The HomePod includes a built-in power cable that should not be removed. In the rare instance that the cable is detached or damaged, do not attempt to remove or plug it back into HomePod. If the cable is removed or impaired, damage could have occurred to the cable or the internal components of HomePod. 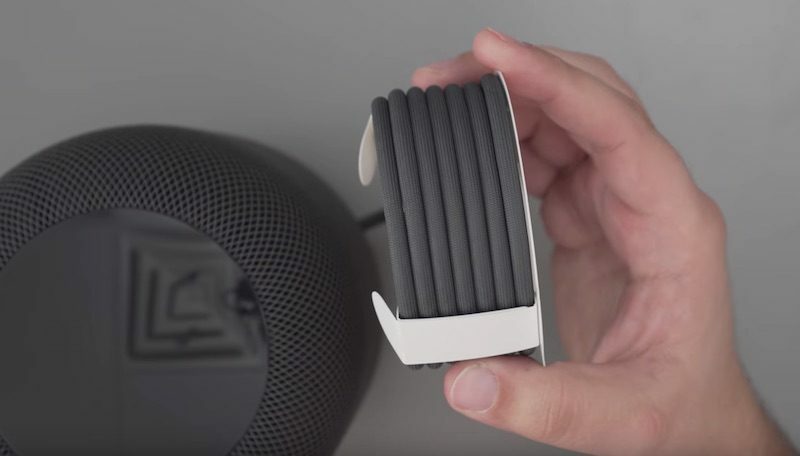 If the power cable is damaged due to an unintentional reason, such as a dog chewing on it, Apple notes the HomePod can be mailed to one of its repair centers and fixed for a flat-rate out-of-warranty fee of $29 plus tax in the United States, £25 including VAT in the UK, and $39 including GST in Australia. Out-of-warranty essentially means that the flat-rate cable repair fee is available to any customer at any time. The affected HomePod does not need to be within Apple's limited one-year warranty period, nor is AppleCare+ required. The only requirement is that the HomePod passes Apple's visual-mechanical inspection, which checks for other external or internal damage. If the HomePod does not pass, but is still eligible for repair, then the only option is a whole-speaker replacement for $279 in the United States, £268 in the UK, and $399 in Australia. The whole-replacement fee is also applicable to mostly any other kind of damage, unless a customer purchases AppleCare+ for HomePod. AppleCare+ extends a HomePod's hardware coverage to two years from its original purchase date, and adds up to two incidents of accidental damage coverage, each subject to a service fee of $39 in the United States, £29 in the United Kingdom, and $55 in Australia, plus the upfront cost of the plan. If your HomePod requires service, the process can be initiated by contacting Apple Support, booking a Genius Bar appointment at an Apple Store, or visiting an Apple Authorized Service Provider. Would it have killed Apple to just give the device a goddamn normal power plug? What the heck is the point of this machine? It’s much more expensive than the competitors, and much more inconvenient... What’s next? The performance degrades as the wire ages? Come on Apple... I was seriously considering on getting it, and now it’s not even worth it to me. Because the cable is non-removeable? What is the value in it being detachable? Seems like it’s help for packaging. Obviously cord replacement if damaged. Anything else? If you live in the U.K. the plug is larger than in the Us. Some people like to thread the thin end through their furniture desk area, tv stands to make the cables tidy. Not having it detachable will make this difficult. BUT MACRUMORS PEOPLE INSISTED THEY WEREN'T REMOVABLE!!!! Now we'll need to find something else to be mad about. Nah people will still be mad. If it wasn’t the cord they’d find something else to freak out over. Apple TV has a removable cable. Why not use a similar/same cable for this. Damn I was going to mount mine on the ceiling and use the cable for pullup strength training whilst the music played, but if it's going to pop out like that .. I'll need another plan. Does that mean it only Cat5 lives left. What the heck is the point of this machine? Not sure why you’re even asking this question. However, obviously it’s intended to deliver a home audio experience first AND act as a smart speaker. It’s Much more expensive than the competitors, but it’s also offering a much better listening experience. Not sure how it’s any less convenient then the other smart speakers, considering they literally do all the same thing. Do you mean the complete HomePod? If I'm not supposed to remove the cable, why should I remove it and send it to Apple? But let's be real, this is exactly what they'll do at Apple Repair Centers: Unplug old cord, replug new cord.